History of the theatre - How to become Parisian in one hour ? The name Théâtre des Nouveautés has been used successively to refer to several different Parisian theater companies and their buildings, beginning in 1827. 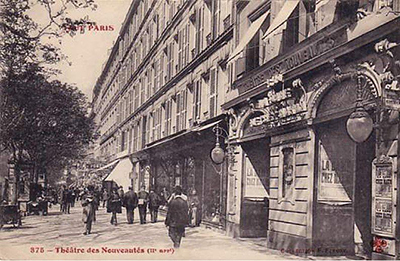 The current Théâtre des Nouveautés was established in 1921 at 24 boulevard Poissonnière, (Paris, 9th arr.) under the leadership of Benoît-Léon Deutsch in collaboration with Gilbert Dupé. Built by Adolf Tiers, the architect behind the renovation of the Moulin Rouge, the hall was inaugurated on April 21, 1921. The programming was devoted to operettas and comedies. For eight years now, How to Become a Parisian in One Hour? has been playing all year round at the Théâtre des Nouveautés. Performed at this historical venue, so emblematic of the French capital, How to Become a Parisian in One Hour? has now earned its place in the history of French theater. Putting on successful comedies has always been something of a tradition at Théâtre des Nouveautés. In 2012 it was bought by the producer Pascal Legros, and is run by Maria Pipaud.